I’m always suspect of Cajun food served at restaurants outside of Cajun country. People have this warped sense that Cajun food should be doused with cayenne, cooked until it’s burnt and/or will contain things totally foreign to a Cajun dish. For instance, we took a family member out to dinner one evening at a really nice restaurant in a swanky part of town. He and his wife were stuck at the airport one night, and they called us to see if we were free for dinner. The restaurant had gumbo on the menu. His wife is German, so she asked him what it was. He described it as having a tomato base and a soup-like consistency. I just about fell out of my chair. There aren’t tomatoes in gumbo! He looked at me and said “Well, honestly – what do you expect from this place” and I had to agree. We weren’t dining at a Cajun restaurant and while tomatoes are in some gumbos – that’s more of a creole style gumbo than a Cajun gumbo. Needless to say, I’m a bit picky when it comes to choosing where I’ll eat gumbo – because some people are simply clueless when it comes to Cajun food. 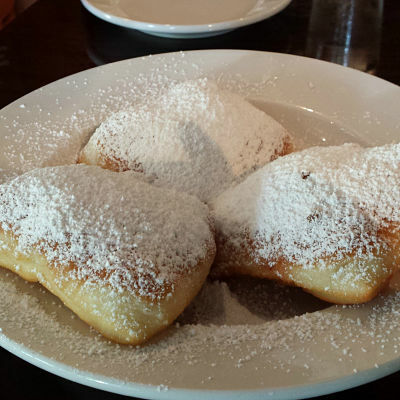 Adele’s beignets are delicious – best biegnets I’ve had in Atlanta. The owners of this little gem – Chef Marc and his wife, Ruth – are the nicest people you’ll meet. Marc played football at ULL (back when it was USL) and worked as a chef in New Orleans – then moved to Atlanta and opened Adele’s – which is named after his wife (it’s her middle name – isn’t that sweet?). The beignets here are legit – save room for them. They have specials, which change daily – but my favorite is their crawfish etoufee’. If you go for breakfast and they have biscuits with crawfish gravy – that’s always a winner as well. Reservations as usually required on weekends and evenings – it’s a small dining room and it usually fills up. Yes, that’s a testament to how tasty their food is. This place is like someone picked up Veron’s in Lafayette and relocated it to Marietta. Here you’ll find delicious seasoned cuts of meat, sausages made in house and other meat counter items – like a whole chicken stuffed with crawfish or pork stuffed rabbit. They also carry a small assortment of authentic Louisiana products, so if you’re looking for Jack Miller BBQ sauce, you can get it there! I have more resources to share in upcoming posts. These aren’t the only 2 great Cajun places in Atlanta. I’ve stumbled upon authentic style snoballs and some great boiled crawfish. Stay tuned! What’s your favorite Cajun restaurant or store in Atlanta? Keep me informed of new posts, products & updates!